Hello fans! 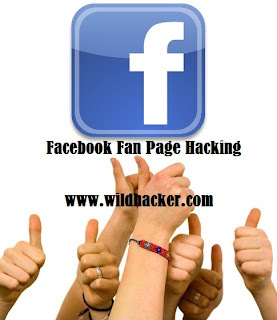 Many of my site visitors asked me about how to hack Facebook fan page. As Facebook Fan Page is an excellent platform for communication and for spreading our bussiness in world, as a reason if which it has become the number one target of hackers. Now lets start the tutorial of facebook fan page hacking . First of all we will need to setup an exploit and a website to host that exploit. If you already have a registed hosting account then its great otherwise there are couple of free hosting websites that can be used for such purposes like 000webhost.com etc. Step 1: First download Facebook page hacking exploit. Step 2: Now open the pagehack.js [in package] with notepad and search for nk@wildhacker.com and change nk@wildhacker.com with your facebook email. Step 3: Now you have to change the viral text which will be sent to the friends of the victims. To do this, find the text Hey See what i got! and replace it with your own text. This text will be sent to the facebook wall of 15 friends of the victim. Since it is an autoposting bot, to prevent facebook from blocking it, I reduced its capacity to 15. Now just save it as anything.js (Tip: Be social engineer and rename it to something more attractive like getprizes.js or booster.js) and then save it. Tip: Tell him that it will make your page safe, or something else like attracting. When he will put this key in address bar and that's it you will get a notification that you are admin of his page now. Enjoy, But don't hack for bad cause, I will not be responsible for any consequences made by you. I hope you will be able to hack any Facebook fan page after reading this post.please do comment share and like this post if the information below is helpful to you.